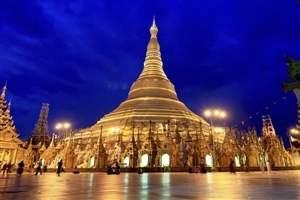 Start your trip around Burma in the city of Yangon, where you will be able to pay a visit to the sacred Shwedagon Pagoda; which is regarded as one of the biggest attractions for visiting the city. Standing at nearly 100m in height, the temple dominates the city skyline and contains a number of Buddha relics that make it the most sacred temple for the Burmese people. With two days to explore the city, you could spend time talking a walk around Inya Lake, learn about the history and culture of Burma at the National Museum or spend more time visiting the numerous religious monuments that play an important part in life in both Yangon and beyond..
Head away from Yangon with a flight to the ancient city of Bagan, where you will have time to explore the thousands of temples and pagodas that can found littering the area. 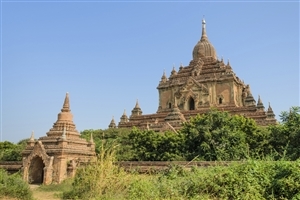 As well as investigating one of the biggest archaeological sites in the world, you’ll enjoy the chance to marvel at the beauty of the sun falling over some of the ruins that remain, while you could also experience the stunning sight of Bagan from the air with an optional hot air balloon trip as your own expense. Experience life on the water as you join a cruise along the Ayeyarwaddy River, passing through beautiful unspoilt countryside and gaining the opportunity to see local life as you travel along the river through numerous small villages that can be found lining the riverbank. Following a unique chance to see the culture and nature of Burma, you’ll spend the night onboard, with the chance to fall asleep on deck under the stars. After an early morning walk to meet some of the locals, you’ll continue on to Mandalay, the last royal capital of Burma and the second largest city. There will be the chance to take a trip up Mandalay Hill to take in the stunning views of the city below, with other highlights to consider including the Mahamuni Paya sacred temple and the ‘Buddhist Bible’ to be found in Kuthodaw Pagoda. After a trip across the longest teak bridge in the world, you’ll arrive in the town of Kalaw as you head towards Inle Lake. The mountain hideaway will provide the perfect location for you to spend some time relaxing and admiring the scenery, while there is also the opportunity to take a walk into the surroundings forests and to visit the nearby villages to see what local life is all about. From Kalaw, you’ll continue through the mountains to Pindaya to visit the huge collection of Buddha temples that can be found within the labyrinth of caves near the town. 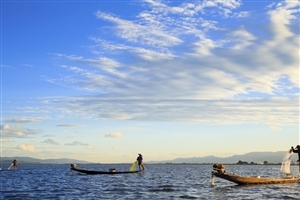 From there, it’s on to Inle Lake to spend time exploring the floating markets and stilted villages to be found around the water. You can head out onto the water by boat and see the local ‘leg rowers’ in action, or can stay on dry land and cycle around the lakeside to watch as the Burmese people go about their daily business. Depart the Shan State to head back to Yangon, where will be given further time to explore the city; visiting the Taukkyan Cemetry andwatching the sunset from the top of Sakura Tower before a final group dinner and your departure for home.